Over the course of its history since the founding of the Tokyo Music School, the Piano Course has produced outstanding musicians based on its mission to absorb and promulgate throughout Japan musical influences from the West, staking out a global presence in this capacity. Long ago, at the Ongaku Torishirabegakari (Music Investigation Committee), the university’s predecessor, this course of study originated as the yokin (“piano”) program, with a single piano introduced by L.W. Mason. The university has attracted attention from around the world in recent years and is now routinely counted on to produce graduates of the highest caliber, capable of thriving in musical professions in Japan. Based on a regard for both tradition and progress and the importance of individuality, its mission is to provide the support needed by talented young students to cultivate their talents and to grow into artists with a humanistic outlook. Faculty: The curriculum at the university Piano Department focuses on solo, private lessons and is designed to enable students to acquire a balanced repertoire from among grand piano music. In the solo performance that forms the core, detailed guidance is provided for the acquisition of advanced techniques and musical training so as to enable a precise understanding of different styles in diverse works. ・The first-year students’ “Performance Practicum” for which students freely select a musical number. ・The second-year students’ “Practical Examination” for which students select two different periods from the Baroque, classical, romantic, and modern periods and perform pieces by compiling them in an approximately 40-minute program. ・The third-year students’ “University Concert” for which students freely select a piece for a public performance of an approximately 30-minute program at the Sogakudo Concert Hall and a “Concerto Audition,” again by the third-year students. ・The fourth-year students’ “Graduation Performance” for which the students select at least three periods from the abovementioned four-period classification and perform together for approximately 60 minutes. Outstanding performers perform in a concert with the Geidai Philharmonia and are also provided other opportunities to perform on and off the university campus. In addition, courses such as “ensemble concerts” for practicing piano ensembles and duos with instrumental music, “chamber music” with which students can gain experience of ensembles with other instruments, “accompaniment music” where students learn to play an accompaniment mainly to classical style songs have been established, thus nurturing individuals with broad insights and a wide range of abilities. Master: In the Master’s Program of the Graduate School of Music, the curriculum fosters an advanced artistic and theoretical research and aims to nurture independent musicians who have a deep musicality and a theoretical and humanistic outlook as pianists. Doctor: In the doctoral program of the Graduate School of Music, the aim is to nurture individuals who have an enhanced originality and can participate in various activities in Japan and internationally. It is essential that they possess an enhanced sophisticated and deep artistic sensibility and theoretical analytical ability. Faculty: With content-rich practical guidance for four years and acquisition of related subjects, the aim is to nurture individuals who can adapt to diverse aspects after graduation such as further research, performances, study abroad, education, and contribution to society. The Bachelor’s degree is awarded once the stipulated courses have been studied, the specified credits have been acquired, and graduation has been approved. Master: The Master’s degree is awarded to individuals once thesis guidance and lessons in practical techniques with enhanced expertise have been conducted in accordance with the individual research plan, the first university Master’s recital (half-recital program) and the practical performance for degree review (about one hour) and the thesis review has been conducted, and the students have passed the review. Doctor: The doctoral degree is awarded to individuals once lessons in practical techniques to further enhance advanced professional expertise and guidance consultations for further research are conducted, the first university doctoral recital (full recital program) and the practical performance for degree review (full recital) and thesis review has been conducted, and the students have passed the review. With the exception of several classes, the curriculum throughout the undergraduate and graduate programs is tailored to the temperament, interests, and goals of each student, based on one-on-one interactions with instructors. To hone ensemble skills, instructors from the fields of string instruments provide advanced practical training. From the first year through graduation, the curriculum is organized flexibly to allow students to explore their individual potential. Students are given unusual latitude in selecting specific works from multiple historical periods to perform in exam recitals. 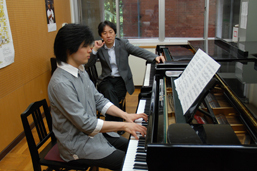 In the final exam scheduled for the end of the second year, students perform two pieces in a program, each expected to last around 20 minutes. In a university concert scheduled for the third year, students perform before the public in Sogakudo Concert Hall. At the end of the school year, concerto auditions are held for the opportunity to perform in a special morning concert with the Geidai Philharmonia. As their fourth-year graduation exam, students give two recitals, one in a concert hall before the public (about 30 minutes in length) and another before students and faculty (30 minutes or longer). By graduation, students have typically completed one and one-half to two full recital programs. In addition to the study of the solo repertoire, students have the option to take part in accompanied songs, ensemble performances and chamber music performances to develop their capability to successfully perform various musical compositions and ensemble works. In the graduate master’s degree and doctoral programs, each student pursues advanced performance and research as a pianist, working from his or her independently-chosen study plan. An annual recital is a requirement for both master’s and doctoral students. To obtain their degrees, students must perform a program of roughly one hour in length. Degree requirements also include a written thesis. Students are required to collect sufficient materials and develop the analytical abilities needed to write a publishable thesis. Many graduates of the undergraduate and master’s degree programs have continued their studies overseas. Others have participated in overseas training sessions and international competitions. 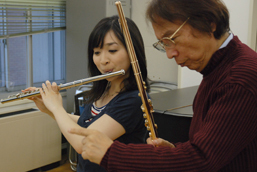 Drawing on the knowledge and skills developed as performers and instructors, graduates have gone on to thrive in various musical endeavors in Japan and around the world. The Organ Course was established as part of and concurrently with the Faculty of Music. Students in the program study a broad-ranging repertoire covering approximately 700 years, from the Renaissance through today. 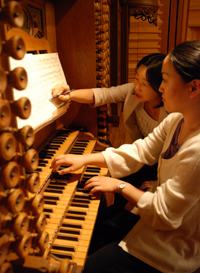 Introduced into Japan alongside Western music, organs were used in the music conservatory program at the Ongaku Torishirabegakari (Music Investigation Committee), the university’s predecessor. The instrument was known at that time by the Japanese term fukin. A course of study based on the organ was established in 1900, during the days of the Tokyo Music School. Since the organ is primarily an instrument built to play an essential role in European church services, in addition to learning the techniques required to play the organ, students study the construction of various types of organs used for compositions, each of which reflects the circumstances of the time and place of origin, as well as the forms of composition and performance practices of each period. The university features three superb organs of various configurations and two smaller practice organs to provide the instrumental foundations for building familiarity with a broad repertoire. Faculty: The Organ Department conducts practical courses, basso continuo, and ensemble playing lessons to develop basic abilities required for research and expression in Organ Performance. To acquire knowledge essential for organ performances, performance conventions specific to the period and region (performance praxis), methods of organ construction, two 30-minute recitals (university concert and graduation concert) are conducted. Apart from these specialized compulsory subjects, basic subjects in music such as solfege, harmonics, and music history are studied to build the foundation as musicians including study of educational subjects and foreign languages required for literature research. Furthermore, to deepen the knowledge and experience related to organ, the department invites various lecturers from abroad and conducts master classes, organ tuning practice, and various kinds of seminars and workshops. This leads to the integration of acquired knowledge and techniques and develops enriched musical abilities. Master: With the basic abilities acquired in the undergraduate years as the foundation, in the Instrumental Music special study course in the Graduate School of Music, students conduct literature research in the department, enroll in practical courses in the department, and conduct music analysis and improvisation of performance techniques to develop more advanced and professional expressive techniques and knowledge. To aim for independence as musicians, once a year students decide on a theme and perform a 45-minute recital based on it and the faculty members provide appropriate guidance to prepare for this. In the final year, students write the Master’s thesis and prepare a Master’s performance program based on this theme, which are reviewed by the Degree Review Committee. Doctor: The aim is to nurture individuals with advanced and specialized musical abilities, cultivate a broad range of professional knowledge and insights related to the art of music, and who help widely spread Organ Arts in society. Through the implementation of guidance on research themes from several faculty members, guidance in practical techniques in one’s major field of study, and the 60-minute doctoral recital once a year, the program nurtures outstanding musical performers with a broad vision. Faculty: The Bachelor’s degree is awarded to individuals who have acquired a wide range of expression techniques for organ performances, in addition to basic knowledge of music, and have been recognized as independent musicians capable of paving their own way for conducting research. The graduation certification is determined depending on whether the students have fulfilled the requirements for graduation. Master: The degree is awarded to students who have acquired advanced and in-depth knowledge related to organ performances and are recognized as possessing the potential to work proactively as independent musicians of outstanding caliber. The Master’s degree is awarded once the students have been enrolled in the Master’s Program for the stipulated period and it has been adjudged that they have fulfilled the above mentioned goals through the study of lecture subjects in the Master’s Program and writing the Master’s thesis. Doctor: The degree is awarded to students who have acquired advanced and in-depth knowledge related to organ performances and who are recognized as possessing the potential to work proactively in guiding roles in society as independent musicians of outstanding caliber. The doctoral degree is awarded once the students have been enrolled in the program for the stipulated period, have acquired the basic credits essential for the doctoral program, have passed the review of the doctoral dissertation within the minimum period required for graduation including the final performance examination. In addition to required subjects such as 60 minutes per week of organ lessons and practical courses in basso continuo playing (first and second years) and ensemble playing (third and fourth years), also performed weekly, required advanced courses include the study of forms characteristic of organ works, required for all undergraduates throughout the four years of the program; an introduction, also required, to the organ (organ construction methods) in the first year; and two 30-minute recitals in the fourth year (university concert and graduation concert). Additionally, students study basic music topics such as solfege, harmonics, and music history, as well as foreign-language and educational subjects needed for their literature-based study. This work is intended to build the foundations for student development as musicians. Other program activities include special lectures (master classes) led by visiting instructors from outside the university, as well as practical training in organ tuning and various seminars and workshops. The graduate-level program focuses on providing instruction in more advanced performance and expressive techniques, based on foundations laid down during the undergraduate years. In the instrumental special study course of the Graduate School of Music, students are required to identify a research theme at the start of each academic year, and acquire advanced expertise through literature-based study, including reading materials in their original languages, based on knowledge attained through the study of forms as undergraduates. In the master’s recital, each student determines a recital theme and prepares for his or her solo recital together with instructors. In addition, in the degree recital held upon completion of the program, students present recitals, performing works related to work done for their master’s thesis. The Strings Instruments Course in the Department of Instrumental Music has a long history within the university. The study of strings instruments at the university dates back to February 1881, when a total of 10 instruments ordered from Boston by university employee L.W. Mason arrived and were set up in the Ongaku Torishirabegakari (Music Investigation Committee). These included violins, violas, cellos, and double bass instruments. Since the days of the Tokyo Music School, the program has produced numerous outstanding performers who have gone on to support the world of music in Japan. While education in the past has focused on the solo repertoire, the program in recent years has also focused on education intended to impart ensemble skills. The Strings Instruments Course provides training in the following five instruments: the violin, viola, cello, contrabass, and harp. The aim is to foster individuals who can conduct an in-depth study of a wide range of creative works from classical to modern and acquire techniques for performance enabling them to be internationally proactive as musicians and contribute widely to the music culture. Faculty: The aim of lessons in practical techniques is to further improve performance techniques and expressive abilities irrespective of the year of study, to gain an understanding of musical compositions, and to make further progress in one’s research and repertoire while receiving guidance from the faculty. The curriculum is designed to enable research and provide experience to develop advanced ensemble skills in conjunction with private lessons. In the first year, students develop basic abilities in the fields of chamber music and string orchestra through year-round classes in the same domains. After the second year, through classes in student orchestra, chamber orchestra, and an elective subject of chamber music, students further develop advanced ensemble skills, expressive abilities, and a greater understanding of music. Master : The Master’s Program comprises a curriculum that aims to improve qualities as musical performers of an even more advanced level and acquire further expertise. Research focused on specific themes is also recommended. 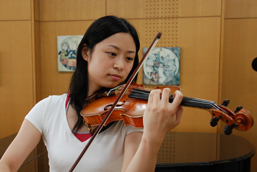 The curriculum is diverse and varied including research on musical compositions through lessons in practical training, special study classes for different instruments, participation in chamber orchestra, Geidai Philharmonia concerts, and chamber music, thus nurturing the objective of independent study. Apart from activities within the university, participation in performances, concours, and lectures outside the university are also recommended. Doctor: The doctoral program nurtures individuals who conduct advanced and specialized research focused on specific themes under practical guidance and possess advanced capabilities in both research and performance. The following two points comprise the program’s fundamental educational policy. Students learn, chiefly through a repertoire consisting of solo works and duet sonatas, how to improve performance skills on each of their instruments. At the same time, they explore the interpretive aspects of performance based on a consideration of various factors, including the form and harmony of each piece. Through classes in string ensembles, orchestra, and chamber music for trios and larger ensembles, students gain experience in playing a broad range of ensemble music. Recitals during the first semester in each instructor’s classes give students the opportunity to present what they have learned. In this way, students can study by focusing on a range of repertoires, with sufficient performance time for each individual. The second semester features periodic recital exams. In the first year of the undergraduate program, these exams also serve as auditions for the Fukushima Scholarship. In the third year, they serve as auditions for the Ataka Prize, a notable university honor. In the fourth year, they serve as auditions for appearances in the Morning Concert, performed with the Geidai Philharmonia. Presented in Sogakudo Concert Hall, the fourth-year graduation recital gives students the opportunity to demonstrate what they have learned during their four years of study. These recitals also serve as auditions for various recitals for new performers. The second semester of the third year of the program also features a university concert presented in Sogakudo Concert Hall. The goal of the graduate program is to refine technique and expressive powers based on foundations established during the undergraduate years, in the process allowing each student to develop an individual voice as a professional musician. As in the undergraduate program, the focus remains on ensemble education, with courses in chamber music and chamber ensembles. Credit is offered for an appearance as an understudy in the Geidai Philharmonia. Master’s degree students in the Strings Instruments Course may choose to meet one of two sets of requirements: A recital exam alone, or a recital exam and a written master’s dissertation. For the latter they are required to focus on a theme and present their findings in a written thesis, performing in a way closely related to the thesis; in the former case, the recital must involve more advanced content. As requirements for completion of the program, students in the doctoral program are required to undergo a recital examination and submit a doctoral thesis. As part of efforts to promote international exchange, special public lectures are held several times a year alongside master’s classes, given by noted musicians from overseas. Additionally, special guest professors are invited to Japan for set periods ranging from several weeks to one year, depending on the circumstances, to give individual lessons and lead the orchestra. For international students, an international entrance exam is available for entry into the master’s degree program. A look at the history of wind and brass instruments in Japan shows that instruction in instruments like flutes, oboes, clarinets, horns, and cornets began around 1897, involving chiefly court musicians in the Department of the Imperial Household – known at the time as the Gagaku Bureau of the Imperial Household Office. Members of the army and navy bands began learning to play martial music on wind and brass instruments at the start of the Meiji Period. In contrast, faced with a pressing need to teach voice, the university chose to emphasize vocal music, keyboards, and string instruments in preference to wind and brass instruments. Efforts to refine instruction in wind and brass instruments began with the arrival of Klaus Pringsheim in 1931. A new student wind and brass orchestra was formed in 1935; W. Schroeter arrived in 1936 and began providing horn lessons. Nevertheless, the orchestra routinely required assistance from navy band members to make up for shortages in brass players. The first five recitals of Mahler’s work in Japan were given with help from navy band members. The first three students in the wind and brass instruments program at the Tokyo Music School enrolled in 1935 in the preparatory program to study the flute, oboe, and trombone, respectively. Instructors for the specific wind and brass instruments needed to form an orchestra were in place with the 1949 start of Tokyo Geijutsu Daigaku. Today, the wind instruments programs account for ten different instruments: the flute, oboe, clarinet, bassoon, saxophone, horn, trumpet, trombone, euphonium, and tuba; while students in the percussion instruments programs learn to play all percussion instruments by participating in percussion and marimba ensembles, using chiefly timpani instruments. The goal of each program is to train skilled, sensitive musicians with individual styles. Faculty: In the Wind and Percussion Department of the Faculty of Music, the aim is to nurture musicians with a high level of individuality and musical sensibilities through study in their respective departments. The Faculty promotes the creation of new artistic expressions and acquisition of traditional expressions. Students can establish a thorough grounding in the fundamentals, theory, and practice of performance techniques, attempt to approach a wide range of genres and musical styles, and progress toward more advanced skills and deeper musical expression. The program primarily comprises individual lessons with a focus on humanistic and interactive connect with the teaching staff. Students study aspects such as solfege, practical piano techniques, and music history that are considered essential for musicians and conduct research on ensembles involving orchestra, wind instruments, and chamber music. Master: In the Master’s Program, a diverse curriculum has been devised to enable a multifaceted approach toward individual research themes and with the goal of nurturing individuals who can play guiding roles in the world of music as musicians as well as researchers. As a continuation of the undergraduate program, students participate in practical training in instrumental music and practice analysis of musical compositions gradually acquiring maturity in the experience of performing as musicians. Also as a compulsory subject, students are also required to perform the Master’s recital, which is deemed as an occasion to present their research. As elective subjects, the curriculum has established the Instrumental Music special study course including special lectures on musical compositions in original language, basics of music research, with the aim of nurturing researchers. The program also consists of content-rich classes in practical techniques such as practice of chamber music and orchestra practice with the cooperation of Geidai Philharmonia through which students can broaden their practical experience as musicians. Doctor: The doctoral program in the wind and percussion instrument research area has established subdivisions such as performance interpretation theory, theory of performance expression, theory of performance techniques, performance teaching methodology, study of music schools, study of rhythmics, ensemble research (chamber music, orchestra), theory of musical instruments, (manufacture, structure, history), research on creative works, and study of music history; leading faculty members in each of these fields aid in expanding the understanding of fine arts from various perspectives. Emphasis is placed on nurturing not just independent musicians but researchers with comprehensive academic knowledge who can lead in guiding roles. Acquisition of foreign language skills essential for gathering information and for collaboration from a global perspective is also emphasized. Faculty : The Wind and Percussion Department of the Faculty of Music imparts a deep knowledge and advanced skills in music, nurturing musicians with outstanding abilities who can contribute to the demands of the society. As specialized practical techniques, students acquire various styles from a broad range of periods ranging from 18th century baroque and classical period, and 19th century romantic period, to 20th century modern music. Students also acquire the fundamental aspects essential for musicians such as solfege, practical piano techniques, theory of music, and music history. They further conduct ensemble research in orchestra, wind instrument music, and chamber music. Furthermore, to nurture artists with a rich humanistic outlook and advanced expertise, study of languages and liberal arts subjects is also required. The Bachelor’s degree is awarded to individuals once the specified credits have been obtained, the compulsory class subjects have been studied and credits required for graduation have been obtained, and graduation has been certified. Master: The Department of Instrumental Music (Wind and Percussion) of the Graduate School of Music builds on the fundamentals acquired at the undergraduate level and goes beyond them by imparting profound knowledge and techniques about music from an advanced professional viewpoint and a broad range of perspectives, with the aim of nurturing educational researchers equipped with essential advanced capabilities and able to conduct independent research activities. The goal is not just to foster outstanding musicians but to train individuals who are sufficiently capable of fulfilling guiding roles at the university and in public institutions. The Master’s degree is awarded to individuals who have been enrolled for the specified period, have studied for the required subject classes and obtained the credits essential for completion, and have passed the Master’s performance examination and the review of the Master’s thesis. The level of achievement with respect to the abovementioned goals is assessed for conferment of the degree. Doctor: In the doctoral program of the Department of Instrumental Music (Wind and Percussion), Graduate School of Music goes beyond the fundamental knowledge built in the Master’s Program and aims to nurture outstanding musicians who, as holders of the highest degree conferred by the university, the doctoral degree, are equipped with advanced professional knowledge combined with the capabilities essential to be independent musicians, as well as nurture musicians with a sufficiently humanistic outlook who are capable of performing guiding roles in the core artistic fields in the university and in public institutions. Students set a unique research theme, acquire profound knowledge and techniques about music from an advanced professional viewpoint and a broad range of perspectives, and acquire language skills essential for gathering information and presenting their achievements globally. The doctoral degree is awarded to individuals who have been enrolled for the stipulated period, have studied the compulsory subject classes and obtained the required credits for completion, and have passed the review of the doctoral dissertation and the performance examination. The level of achievement with respect to the abovementioned goals is assessed for conferment of the degree. The program provides a place where students can establish a thorough grounding in the fundamentals, theory, and practice of performance techniques; approach a wide range of music, including music crossing the boundaries of genres; and begin to progress toward more advanced skills and deeper musical expression. The program format primarily involves individual lessons that focus on one-on-one interactions with instructors. Students study ensemble techniques by performing pieces written for the full orchestra, wind-instrument music (with regular concerts given twice annually), and chamber music, gaining the knowledge needed as performers in areas such as solfege, piano, theory of music, and music history. In the master’s degree program, students pursue advanced artistic skills, studying a wide range of fields related to wind and percussion instruments in study characterized by a more narrow focus. In the doctoral program, students pursue advanced, highly-specialized programs of study. To showcase their progress with their studies, students in both the master’s degree and doctoral programs are required to present master’s and doctoral recitals. This program takes an energetic approach to international exchange. In the 2007 academic year, 60 students and conductors from the College of Music at Seoul National University, among several institutions with which the university has concluded international exchange agreements, visited Japan for a joint recital as part of the fall Tokyo Geijutsu Daigaku brass-band performance. Both individual and ensemble performances were well-received. In 2008, in response to an invitation from the College of Music at Seoul National University, Tokyo Geijutsu Daigaku’s brass band traveled to South Korea to give a joint performance at the Seoul Arts Center. Additionally, in 2008, three professors and three students from Germany’s State University of Music and Performing Arts Stuttgart, another of the institutions with which the university has concluded international exchange agreements, visited to perform with university instructors and students. The works performed during this visit included some highly challenging pieces written for chamber ensembles. One international student (from South Korea) currently attends the graduate school. Following graduation, many students pursue careers as solo musicians or as members of orchestras or chamber music ensembles. Others are active as teachers. The university has a long history of chamber music education, in which it has offered curricula under names such as “chamber music” and “instrumental ensembles” since twice-weekly ensemble practice was established at the Tokyo Music School in 1900. The predecessor of the chamber music program was the ensemble studio established in 1964; in that year, student recitals of chamber music began in the university’s older concert hall. A chamber music program was established in 1972. The chamber music program in its current format was launched in 1978 with the goal of providing a stronger ensemble education. From the first recital in November 1974 through the 35th recital in February 2009, annual chamber music recitals have played a central role in university concerts. With its focus on chamber music – perhaps the best starting point for musical education – the program refines student ensemble playing and listening skills to instill a lively sense of musical interchange between students and to deepen musical sensibilities. In particular, the program structure provides attentive support for students wishing to engage in highly specialized study of chamber music. 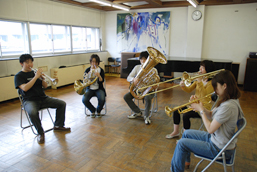 ・More than one faculty member (performing together with faculty members, training faculty) is in charge of one student supporting advanced ensemble research. ・The place of presenting the research result is ensured by arranging for research presentations to be held several times. ・Along with students from the Department of Chamber Music, a seminar format is adopted in the Special Study in Chamber Music to enable students of the String Instrument and Piano Department to study together. The objective is to provide feedback for the actual performance through an exchange of ideas among the students. ・It is important to acquire a deep understanding of the creative works and advanced ensemble skills. ・To internalize the performance techniques to achieve the required musical expression. ・To master communication skills among performers through ensembles. ・In the doctoral program, students conduct research in line with the research theme that has been set and attempt to build a strong correlation between the practical technique and the dissertation. The curriculum is designed to build on work done in preceding years. Chamber Music I, teaching the basics of chamber music, is required for first-year undergraduates in the wind and brass, string, and percussion instrument courses of the Faculty of Music. Chamber Music II, III, and IV, elective courses in which students independently form study groups, are offered for second-year and later students. In these classes, each group is taught by one or two instructors in classes based on a lesson format. More than 80 groups each year take Chamber Music II, III, and IV, demonstrating a sustained and high level of interest in chamber music. A final exam in December also serves as an audition, with selected groups given opportunities to perform in various concerts, including the annual chamber music recital in February of the following year. This class also is offered in the Graduate School of Music as Practical Chamber Music Techniques. Each student of chamber music within the Department of Instrumental Music in the Graduate School of Music receives careful guidance in line with his or her research themes from a faculty adviser. To provide specialized and practical study and to help familiarize students with the highest levels of expressive skill and refined chamber music sensibilities, the curriculum provides for a series of rehearsals in which students receive guidance while performing alongside professional musicians active in chamber music performances. Other curriculum components include lessons by faculty advisers, twice-yearly presentations of study results in the form of recitals, and degree recitals. Special study in chamber music for students majoring in chamber music, piano, or string instruments involve lively study in a broad range of chamber music fields not addressed in individual unit courses alone – for example, string quartets and piano trios – based on analysis and performance interpretations of thematic works in a seminar format and through independently-formed groups focusing on practical chamber music techniques. The Early Music Course in the Department of Instrumental Music is a newer course of study established in 2000 by adding classes on the recorder and baroque violin to the harpsichord program and allowing graduate-level study in baroque cello, baroque vocal music, fortepiano, and the baroque organ. A doctoral course was added in 2003. In 2005, it also became possible for students in the Practical Music Course and international master’s degree students to take all seven classes offered within the program. In this program, students primarily learn to perform music from the mid-16th century through roughly 1800, focusing on music from the baroque period, employing methods based on contemporary practice. However, rather than picking a single era from the history of music and limiting the repertoire to that period, the goal of this program is to explore the possibilities of performance excellence by encouraging students to see history in a new light. As part of this approach, students to the extent possible consider historical and cultural factors related to the instruments and performance styles of the period to which each composer belonged, seeking to reproduce music in a manner as close to the intent of the composer as possible and to identify approaches to performance appropriate to that historical period. Master : The four pillars of the undergraduate curriculum are further expanded. Doctor: Students conduct research to deepen and broaden the domains of performance of Early Music including review of various stereotypes already recognized. Specifically, it is required that students deepen the performance research on the research problem that they have set and also devise a unique methodology for literature research that complements it. Faculty: 1) It is important that students make sufficient effort and visible achievements in the four pillars emphasized in the curriculum of the Department of Early Music. 2) It is important that students make sufficient effort and visible achievements in the fundamental abilities required of musicians such as solfege, harmonics, counterpoint, and language skills. 3) In the graduation concert (a soloist performance of about 30 minutes), the students perform in an appealing and convincing way, respecting the style of the composer. The Bachelor’s degree is awarded once the students have been enrolled for the stipulated period, have studied the required subject classes and obtained the credits required for graduation, and have been adjudged as having achieved the abovementioned results and recognized for certification. Master: The Master’s degree is awarded once the students have been enrolled for the stipulated period, have studied the required subject classes and obtained the credits required for graduation, have passed the review of the Master’s thesis and the Master’s performance examination. The students are evaluated from the following perspectives for the degree conferment. 1) It is important that students make sufficient effort and visible achievements in the four pillars emphasized in the curriculum of the department of Early Music. 2) In the completion performance (a soloist performance of 30–45 minutes) the students perform in an appealing and convincing way, respecting the style of the composer. 3) Students must conduct research about the research problem decided upon from the various aspects related to the performance of Early Music, and compile in the form of a Master’s thesis, while presenting the content in an objective manner. Doctor : The doctoral degree is awarded once the students have been enrolled for the stipulated period, have studied the required subject classes, obtained the credits essential for graduation, and have passed the review of the doctoral dissertation and the performance examination. Students present the research results regarding the research problem identified by them from among the various aspects related to the performance of Early Music in the form of a doctoral dissertation and an outstanding performance at the review committee (recital). These are evaluated from the perspective of whether they constitute a unique contribution in the domain of Early Music. With regard to the educational and research structure, study in both the undergraduate and graduate programs is based on the following three foundations, in addition to guidance in practical skills: (i) a focus on ensemble performance and establishing an understanding of the concept of basso continuo; (ii) scholarship in the history and literature of music; and (iii) study of the period’s instruments. Foundation i, which focuses on ensemble performance and on establishing an understanding of the concept of basso continuo, treats ensemble performance as equal in significance to solo performance. Basso continuo constitutes the foundation of this approach. Rather than mere theory, basso continuo is a set of harmonic concepts with direct applications to actual performance. Since this is a crucial element that serves as the foundations for performance techniques in all areas of the baroque period – not just keyboard instruments – it is a requirement for all students in this program. Foundation ii, which examines the history and literature of music, is intended to generate ideas and modes of expression for new performance interpretations by understanding the historical context of the original works and accumulating the necessary basic knowledge and experience. Foundation iii, the study of the period’s instruments, addresses knowledge about various instruments and techniques for adjusting and tuning them. Undergraduates learn through activities including practical lessons and actual ensemble and basso continuo performance while taking courses to improve basic musical capabilities in areas like harmony and solfege and on subjects like languages and music history that are essential to musical scholarship. Students also engage in solo and ensemble performance study after choosing themes of study as opportunities to present the results of their study of performance skills. These activities are intended to enhance the repertoire of each student and to provide familiarity with works across a wide range of styles to give students a well-rounded background by graduation. On beginning the fourth year, students take part in a university recital (in the first semester), then perform as soloists in programs of roughly 30 minutes in length at the graduation recital to showcase the results of their studies. Students in the master’s degree program seek to improve technique and achieve advanced expressive performance capabilities. For the annual master’s recital, students make all preparations related to the recital themselves, going beyond just the actual performance to include program selection, inviting and selecting co-performers and accompanists, arranging rehearsals, obtaining needed instruments, and preparing printed programs. This event helps provide the experience they need to function as active performers. First-year master’s students select their own research themes, begin preparing for their master’s thesis, give seminar presentations on early music literature (in the Early Music Analysis class), and report on the progress of their thesis to allow instructors to confirm that student theses are progressing as planned. As part of the final examination on completing the program, each student performs a recital of a program related to his or her own studies. As in the undergraduate program, students are required to take part in ensemble classes as part of the course of study needed to become independent performers. In keeping with the focus on ensemble performance, at varying intervals, the program offers special ensemble lessons taught by guest performers from overseas. For the upcoming academic year, the program will welcome as a special guest internationally-known tenor Gerd Turk. The program is currently considering accepting international students with the motivation and talent needed to succeed in studies at this level. Program graduates include individuals who have gone on to graduate school for further study or study abroad or to careers as performing musicians or instructors.